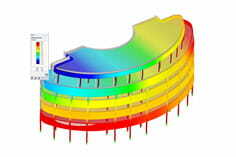 In RF-STANZ Pro I use the sector model to determine the load increase factor ß. Due to singularities in the surface intersection sizes, the ß-values are sometimes set too high. How can I handle this? It is correct that singularities in the FE calculation also affect the results of the determination of the load increase factor β by means of the sector model. Smoothing ranges introduced in the RFEM model have no influence on the ß determination in RF-STANZ Pro. If the results in the critical round section are influenced by the singularities, you have the option of specifying the load increase factor ß yourself. 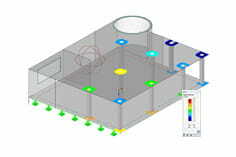 To do this, you can display the "Shear force in sectors" in the result navigator of the RF-STANZ Pro results (see Fig. 01). The maximum value of all sectors is used to determine the β coefficient. In our Knowledge Base you will also find a technical paper to determine the load increase factor ß. You can now estimate in terms of engineering whether this value should be used to determine the load increase factor or not. If not, you as a user can evaluate the progression of the shear force in the sectors (see Fig. 01) and determine the load increase factor ß yourself (averaged value of the considered sector / average value over the entire round cut). In RF-STANZ Pro you have the option of directly specifying the load increase factor ß in the input dialog "1.5 Punching nodes". See Figure 02. Thus, you can handle values resulting from a singularity by individually specifying the load increase factor β. The program can not deliver automatic for this. These points must always be checked and evaluated individually by the planner.